The ultimate riding gloves. 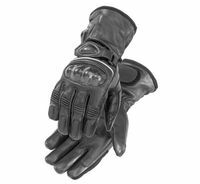 Beautifully constructed, full-leather glove with built-in Warm & Safe elements to ensure optimal warmth and control. Heat controllers sold separately. Visit our Heated Gear department to see all the controller and accessories related to this glove. These gloves are consistent with the major brands we carry, so hopefully you’ve had some experience with buying gloves and can choose based upon the fit of a previous pair. If you have no previous experience with glove sizing, go here for help.